The LOST Crew is busy setting up for a shoot later today and it seems like the filming will be for Episode 5×02. 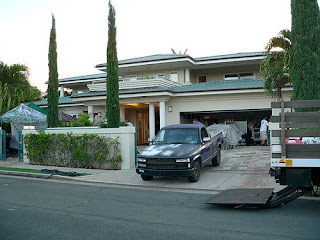 Below are a couple of new set photos of a mansion where the crew is setting up and apparently it is near the homes that are used for Hurley’s and Kate’s homes. As soon as we have more information or a set report, we will post it right away. 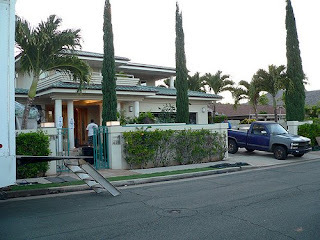 “LOST” set up shop at a $4 million, five-bedroom home in Kahala. It’s a block from Kate’s house and two blocks from Hurley’s mansion, but I don’t think they’ve used this property before.